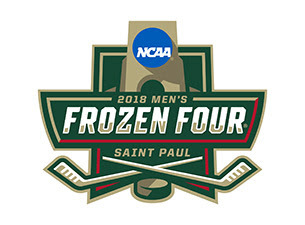 The Frozen Four is set with Notre Dame, Minnesota-Duluth, Michigan and Ohio State punching their tickets to Saint Paul. It will be three Big Ten teams and an NCHC team with Minnesota Duluth. Both Notre Dame and Ohio State are looking to win the programs first ever national championship. Michigan is looking to win its first title in 20 years while Minnesota-Duluth looks to win its first title since 2011 when the Frozen Four was also in Saint Paul. ECAC teams went 0-3 in the NCAA tournament but the conference is expected to be strong next year with a lot of talent returning to many of the top teams. Let's take a look at some how some of the Quinnipiac commits did over the past week with some of them expected to be in the Bobcats lineup this coming fall. It was a very strong week for Ethan De Jong who had 7 points (4 goals, 3 assists) in four games played in helping to lead the Prince George Spruce Kings to a 4-3 series win over the Surrey Eagles. His performance in Game's 6 and 7 with Prince George trailing 3-2 in the best-of-seven series are what makes him a rising star. He had two goals an assist in each of the games rallying the team to a series win. In 14 playoff games he has 15 points (9 goals, 6 assists) tying him for third in the BCHL for playoff scoring. The junior career of Desi Burgart has come to an end. His Surrey Eagles team fell 4-3 in the best-of-seven second round series to Prince George. This past week Burgart had one goal in two games played. He finished his playoffs with 11 points (10 goals, 1 assist) in 12 games played which followed a regular season in which he had 50 points (22 goals, 28 assists) in 53 games played. His next stop is Hamden where will he will be part of the 2018-2019 incoming freshman class. The 2017-2018 junior season has ended for T.J. Friedmann. His tell fell in the second round 4-1 to Powell River. He finished the playoffs with 5 points (3 goals, 2 assists) in 9 games played but missed some time with a lower body injury. He has one more junior season before making the move to Hamden so its expected he will be returning to the Victoria Grizzlies next season. He finished a strong regular season with 57 points (22 goals, 35 assists) in 58 games played. Outside of Ethan De Jong, the only other BCHL commitment still in the playoffs is defenseman Nick Kent for the Wenatchee Wild. His team has already advanced to the third round of the playoffs. 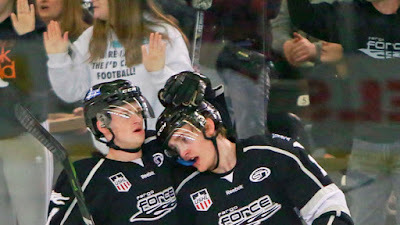 William Fallstrom had a four point week for the Fargo Force in helping clinch a playoff spot. In three games played he had two goals and two assists. On the season in 52 games played, he has 41 points (13 goals, 28 assists) with a plus 14 rating. Wyatt Bongiovanni continues to be sidelined by an undisclosed injury for the Muskegon Lumberjacks. 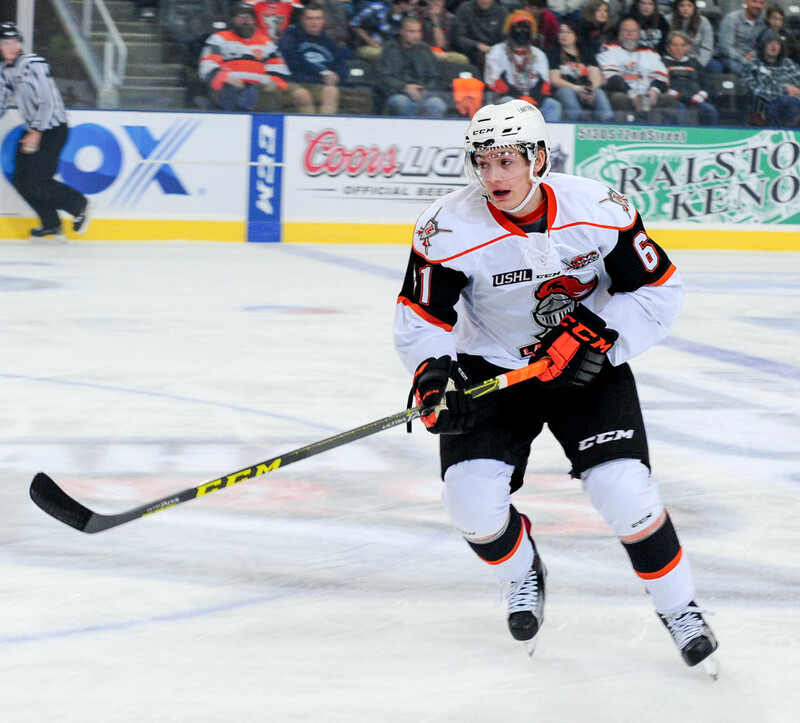 Dom Fensore had two assists in three USHL games over the weekend. In 30 USHL games played, Fensore has 15 points (1 goal, 14 assists). Justin Robbins went 1-1 with 6.94 goals against average and an .818 save percentage for the Chicago Steel. On the season, Robbins is 6-8-0-1 with a 4.08 goals against average and an .873 save percentage in 20 games played. Marcus Chorney picked up one assist in two games played for the Amarillo Bulls. On the season he had 24 points (5 goals, 19 assists) in 56 games played with a minus 6 rating. Daniel Winslow had two goals over the weekend in his teams playoffs series win over the Jr. Bruins. He had the game winning goal in the 3-2 win in Game 3 as the Jersey Hitmen will move on to the championship series against the Islanders Hockey Club. Connor Tait has had a strong last four playoff games for the Jersey Hitmen. So far he has 3 goals and 1 assist including a game winning goal in Game 2 against the Jr. Bruins. He had a goal in Sunday's Game 3 clinching win as the Hitmen have moved to the NCDC finals against the Islanders Hockey Club. Cameron Boudreau's season has come to an end with a 2-1 series loss to the Jersey Hitmen. He had two assists in three playoffs games over the weekend and finished with two assists in six playoff games. He will be playing another season of junior hockey with it being most likely for the Jr. Bruins. Matt Cassidy had one assist this past week for the Brooks Bandits who closed out their best-of-seven series with the Drumheller Dragons 4 games to 2. They now move on to play the south division top seed Okotoks Oilers. Jacob Quillan of the Steele Subaru Major Midgets had three assists in two games played helping his team win the Nova Scotia Major Midget Hockey League championship over Halifax McDonalds. In 15 playoff games this year, Quillan has 16 points (5 goals, 11 assists). Steele Subaru will now compete in the 2018 Major Midget Atlantics. Even with the Quinnipiac season over for the past the college hockey season continues and thus we have reached the point of the 2018 NCAA Tournament. We have gone from 60 teams to 16 and after this weekend we will be down to the Frozen Four which will commence April 5-7 in Saint Paul, Minnesota. I am going to breakdown each regional and give my Frozen Four picks. In two weeks I will break down the Frozen Four but for now here is my picks and they will probably be wrong. This is a bracket that is really wide open in my opinion with possibly any of these teams reaching Saint Paul. 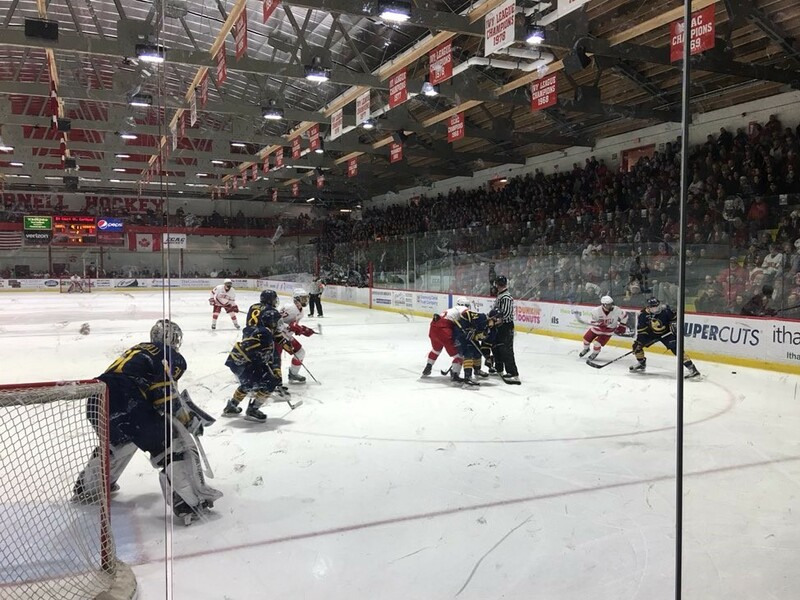 #1 seed Cornell and Boston University already met once this season at the end of November with the Big Red holding off a Boston University comeback to win 4-3. Both teams have been smoking hot since the turn of the calendar with BU going 13-3-3 in the second half of the season en route to a Hockey East tournament championship. 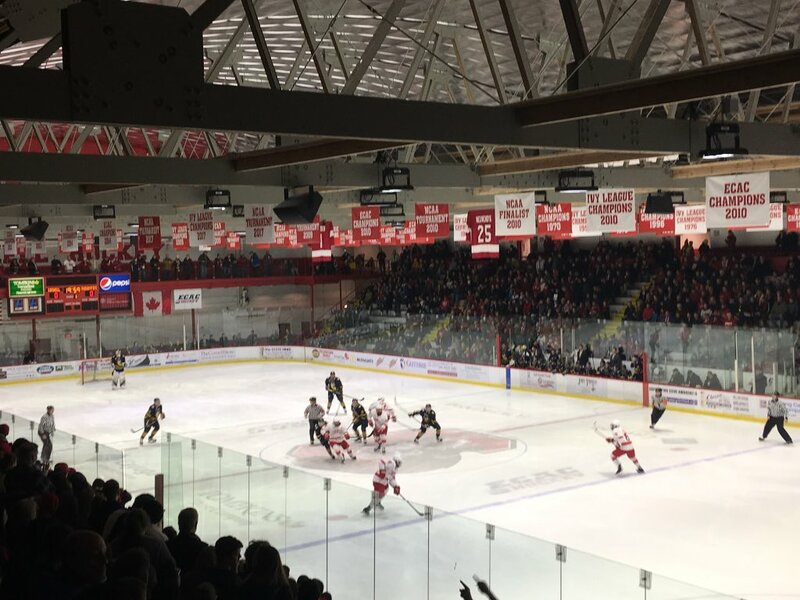 Cornell won the Cleary Cup as the ECAC regular season champions but were stunned by eventual tournament champion Princeton in the semifinals in Lake Placid. Both teams can play a heavy game but BU has the higher end talent but is really a top heavy team while Cornell has much more depth. If some of the lesser known players show up for BU then watch out. Brady Tkachuk and Jordan Greenway have the ability to dominate down low. Cornell's defense and goal-tending have been elite this year and are the key to their success. BU is a different team than the one that played Cornell back in November and that is going to make a difference. I have Boston University returning the favor and knocking out #1 Cornell. Northeastern is a top heavy team with Gaudette, Sikura and Stevens making up 58% of the teams goals scored. You let them score and they are more than likely going to beat you. Northeastern has the better goal-tending with Cayden Primeau leading the way with a 1.88 goals against average and a .932 save percentage. Michigan has a lot of offensive balance with seven players with 20 or more points including two with 40 or more points. Where they struggle is on defense and in goal and against Northeastern that could be a recipe for disaster. Overall I think Northeastern is the better all around team and playing close to home will help and there is just something special about this team this year. Northeastern moves on to the regional final. While Northeastern has won three games against Boston University this season and its always tough to win that consistently against any opponent the games have not been close. The Huskies have three elite scorers and a goal-tender that has been excellent this season. They have been one of the best teams in the second half and that is going to carry them to Saint Paul. After slumping towards the end of February with four losses in their final five regular season games, Notre Dame rebounded to win the Big Ten tournament championship in overtime over Ohio State. The Irish have good scoring balance with six players with 20 plus points and a sophomore goaltender in Cale Morris that has been dominant this season. After playing .500 in the second half in the WCHA, Michigan Tech went 5-1 in March en route to the tournament title over Northern Michigan. The Huskies feature eight players with 20 points or more. Goal-tending is likely the biggest issue for Michigan Tech as they have played three players throughout the season. Junior Patrick Munson was strong in the final three tournament games against Minnesota State and Northern Michigan to help win the title. Despite the February swoon Notre Dame has been one of the best teams in the country and I see them moving on against Michigan Tech. Clarkson and Providence is a rematch from earlier this season when the teams met in October in Potsdam and in November in Belfast. Both were wins by Clarkson, who at that time was rolling. The Golden Knights went 1-4-3 in the month of February before rebounding to advance all the way to the ECAC Championship game where they lost in overtime to Princeton. Still the struggles of February give me some pause on Clarkson. They have some talented scorers but seemed to cool off a bit until the conference tournament. They are also a team that is in the NCAA tournament for the first time in 10 years while Providence has made it the last five years. Experience sometimes does matter. Nate Leaman has won a national championship and this team has solid offensive balance, a good defense and solid goal-tending in Hayden Hawkey. I can't see Providence losing three times to Clarkson so I am going with the Friars in this one. Notre Dame and Providence in a regional final is a heavyweight match up. Both coaches have won past national championships though Jeff Jackson won his two championships back in the early 1990's with Lake Superior State. The Irish were a wire to wire champion in the Big Ten and have the much better goal-tender in this game. There is no doubt they want to get back to the Frozen Four to erase the memory of the 6-1 beating they took in the national semifinals a year ago to Denver. Notre Dame uses strong goal-tending to edge Providence for a trip to Saint Paul. Ohio State has had one of the best seasons in their program history and has reached the NCAA tournament in back to back seasons for only the third time in program history. The Buckeyes have a trio of 35 point plus players in Tanner Laczynski, Mason Jobst and Matthew Weis along with a solid goal-tender in Sean Romeo. The one concern about Ohio State is they really didn't beat any one in their non conference schedule that was any good and built their resume strictly on the Big Ten schedule this year. No team had a four year turnaround as the Princeton has. The Tiger are a team that ran off a 6-0 run in the ECAC tournament en route to its first conference championship and NCAA berth in ten years. They are loaded offensively with two 50 point scorers in juniors Max Veronneau (55) and Ryan Kuffner (52) who has 29 goals alone. They have four more players with 30 or more points and have started to play well on defense and in goal with freshman Ryan Ferland. Ron Fogarty's team is a confident bunch and one of the hottest teams going into the NCAA tournament and a nightmare to face on the ice. I'm sensing an upset here of Ohio State as this a Princeton team that tied St. Cloud State twice in December before they started to get rolling and the freight train is not stopping yet especially when this game is 90 minutes from the Princeton campus. Denver and Penn State is a rematch of the regional final a year ago which Denver won 6-3 en route to a national championship. I am not liking Penn State's chances in the rematch either. Despite the game in their home state and Penn State being the host school I think Denver is the much better team overall. While Penn State has a solid offense with six players in double figures in goals the goal-tending is too suspect for me to say this team can win a game in the tournament against a championship team like Denver. The Pioneers boast three players with 40 points or more along with a quality defense and strong goal-tending in senior Tanner Jaillet. They also have the experience of being in the past two Frozen Fours and having won it a season ago in Chicago. This team looks locked and loaded again after winning the NCHC tournament title and they won't be losing to Penn State here. I love everything about what Princeton has done this season as the young and hungry upstart but I can't see them beating a team like Denver that is trying to become the first team to repeat as champions since the Pioneers did it in 2004 and 2005. There is too much talent and experience on Denver and its going carry them to Saint Paul. This is effectively the Minnesota regional that is being played in Sioux Falls, SD. #1 St Cloud is looking to get back to the Frozen Four for the first time since 2013 in Pittsburgh. This is a very talented team with the top eight scorers on the roster all having 20 or more points and none of them are seniors which means that if they all return next season this team could be the likely preseason #1 team. This is a team that scores 3.66 goals per game. They have five players with 10 or more goals this season. Only two of the eight losses this season have been of the bad variety (Miami & Western Michigan) and the one of those losses was in overtime in the second games of the NCHC playoffs to Miami. Air Force finished third in the Atlantic Hockey regular season but won the conference tournament when Robert Morris upset Mercyhurst in overtime in the semifinals. This is the 7th NCAA appearance for the Falcons since 2007 as Frank Serratore has done a great job in Colorado Springs. Air Force lacks elite scoring and only scores 2.68 goals per game so they are going to need some breaks. They have a solid goal-tender in Billy Christopoulous who they need to be big against St. Cloud in order to have a chance at an upset. They will play hard but it won't be enough as I see the Huskies winning this game fairly easily against Air Force. Minnesota State and Minnesota-Duluth is a rubber match, as these two teams split a pair of non conference games each of them winning at home. Minnesota State is a very good offensive team scoring 3.87 goals per game and has six players with 35 points or more along with six players with 10 or more goals this season. They are also very good defensively at 2.07 goals per game with senior Connor LaCouvee having a 1.76 goals against average. Mankato is a two and half hour drive to Sioux Falls so there should be a lot of support for the Mavericks. Duluth has been average offensively at a shade over three goals per game. The leading scorer for the Bulldogs is freshman defenseman Scott Perunovich with 35 points. Riley Tufte and Joey Anderson are Duluth's high draft picks who will need to step up if Duluth wants to advance to the regional final. Sophomore Hunter Shepard has been very good in goal with a 1.98 goals against average and a .924 save percentage. Minnesota State has been the more consistent team this season and probably would have been seeded much higher if they didn't lose in the WCHA semfinal series to Michigan Tech. They are also chasing their first ever NCAA win at the Division 1 level and I see that happening this time around. Mankato gets the job done against Duluth and moves to the regional final. St. Cloud and Mankato split a pair of meetings with each winning easily on the other teams home ice. This should be an excellent well played game and probably one of the better regional finals we could see and I think that St. Cloud edges Minnesota State in overtime to reach Saint Paul. Quinnipiac men's ice hockey senior assistant captain Kevin McKernan has signed with the Fort Wayne Komets of the ECHL, an affiliate of the Arizona Coyotes. McKernan played in 33 games for the Bobcats this season recording 3 goals and 9 assists with a minus 4 rating. Over his four year career for Quinnipiac, the Milbury, Massachusetts native played in 138 games recording 12 goals and 24 assists with a plus 5 rating. He showed some versatility this season when he was moved to forward in the ECAC playoffs scoring a goal in game one of the first round series against Yale. He was part of two Quinnipiac teams that won the Cleary Cup for the ECAC regular season champion in 2015 and 2016 along with winning the schools first ever Whitelaw Cup in 2016 as the champions of the ECAC tournament. He also played in the NCAA Tournament twice in 2015 and 2016 with the latter year making it all the way to the National Championship game in Tampa, FL before falling to North Dakota. 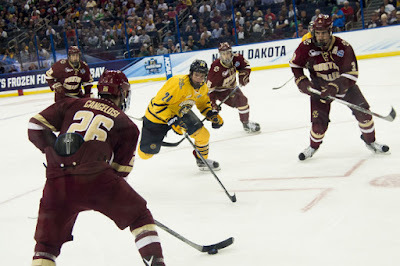 He scored presumably the biggest goal of his career in the National Semifinals against Boston College just 2:31 into the opening period which helped the set tone for Quinnipiac the rest of the game. His senior class will leave Hamden with 94 wins during his time as a Bobcat. Junior defenseman Chase Priskie and freshman forward Odeen Tufto both made All-ECAC teams today as was announced by the league office. Priskie, Quinnipiac's captain made the Second Team All-ECAC after posting 25 points (11 goals, 14 assists) in 37 games played with a team leading 8 power play goals. His 25 points were good for third on the team in scoring behind freshman Odeen Tufto (41) and senior Tanner MacMaster (33). This is the third consecutive season that Priskie has amassed 25 or more points in a season. Priskie was a third team All-ECAC selection a season ago and as a freshman made the ECAC All-Rookie team. Odeen Tufto's 41 points (9 goals, 32 assists) in 38 games played were the most points for a freshman in the country. His 32 assists tied him for third overall in that category but most for a freshman in the country and it broke the Quinnipiac Division I freshman record for assists which was 31 set by Brian Hebert back in the 1999-2000 season . He is the first Quinnipiac freshman to amass 40 plus points or more in a season since Sam Anas did it with 43 (20 goals, 23 assists) back in the 2013-2014. He also had 15 multi point games for the Bobcats this season. 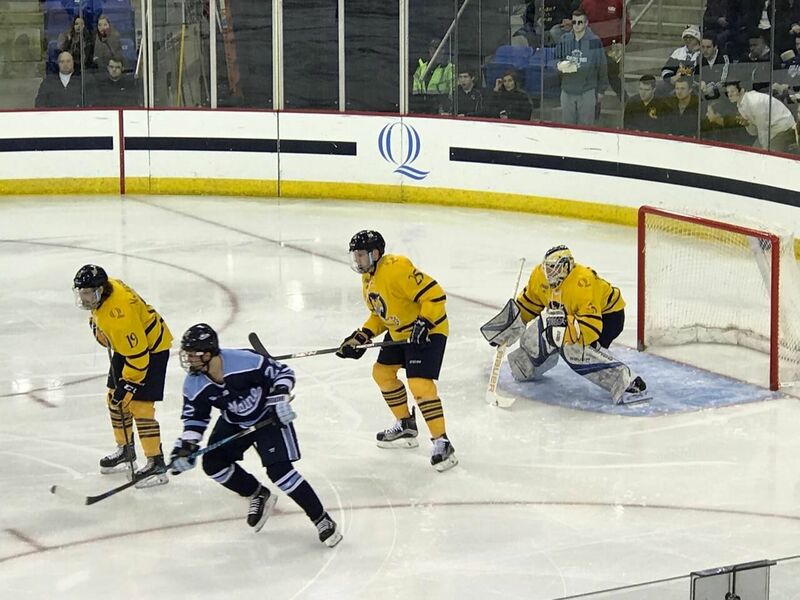 The 2017-2018 Quinnipiac season came to a conclusion on Saturday night. A night after getting blown out 9-1, the Bobcats showed a lot of character battling is strong Cornell team before falling short and losing 2-0. The team finished 16-18-4 which was its worst record since the 1995-1996 season when the school was still playing at the Division II level. While the season may be over that doesn't mean the content here at the blog stops. There is still recruits playing in junior leagues or below, some of the seniors may sign pro contracts or there could be an early departure to the pros from the Quinnipiac roster. We will cover it all and thank everyone that followed this season for the BobcatsHockeyBlog and hope you all continue reading. With that said there was a lot of great play by some of the Quinnipiac commits so lets get to that below. There isn't a hotter player in the BCHL right now than Desi Burgart over the last week. In 4 games played he had 7 goals and that was only in two of the four games. In Game 4 he had four goals while in the clinching Game 6 for Surrey he had a hat trick. He is third in the BCHL in playoff scoring with 9 points (8 goals, 1 assist). His 8 goals are the most in the BCHL playoffs to this point. Surrey now will have a second round series beginning at Prince George. St. Louis, Missouri native T.J. Friedmann missed some time in the BCHL playoffs with a lower body injury but returned for the Victoria Grizzlies Game 7 win. He finished the first round series with 5 points (2 goals, 3 assists) in the four playoff games. Despite his team in an 0-2 hole he has been one of the bright spots early in the playoffs. Victoria begins the second round at home against Powell River. 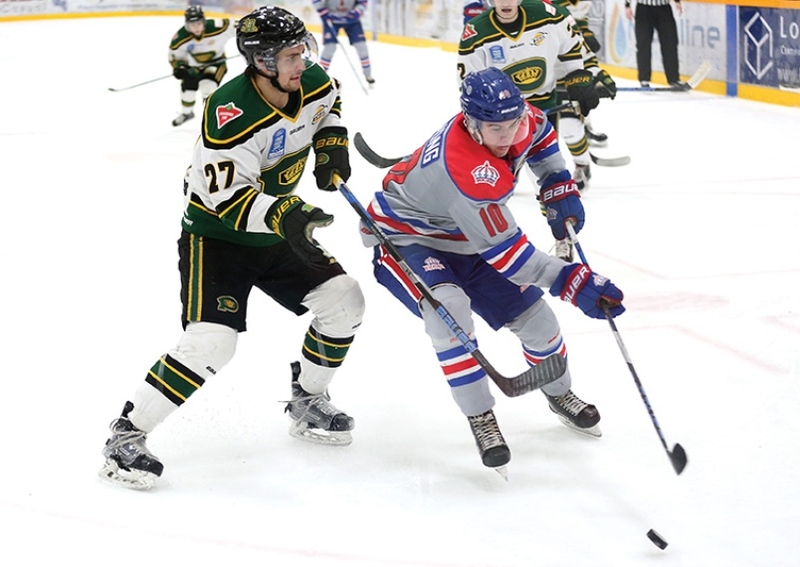 Ethan De Jong had three goals in four games played with week for the Prince George Spruce Kings as they won a Game 7 at home to move into the second round. De Jong has 4 points (3 goals, 1 assist) in 7 playoff games. His team now will host fellow commit Desi Burgart and the Surrey Eagles in the second round. Michael Lombardi had his first BCHL season come to an end. He had a goal in Game 4 as West Kelowna was swept out of the playoffs. He finished the postseason with two goals in four games. He's projected for the 2018-2019 recruiting class but also could be pushed a season for the 2019-2020 class. Nick Kent and the Wenatchee Wild have moved into the second round against the Vernon Vipers. Kent played in 3 games in the first series but did not record a point. William Fallstrom had a pair of assists in two games played this weekend for the Fargo Force. In 47 games, the Sweden native has 34 points (10 goals, 24 assists). His team is currently 4th in the USHL Western Conference and fighting to stay in a playoff spot. 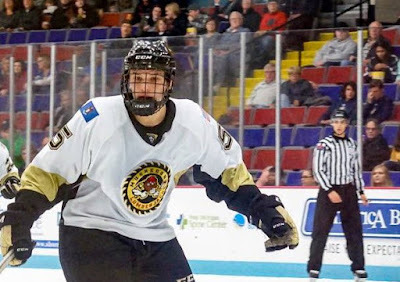 Wyatt Bongiovanni had a five point weekend (2 goals and 3 assists) in two games played for the Muskegon Lumberjacks over the weekend. The Michigan native has 32 points (15 goals, 17 assists) in 33 games played and averaging almost a point per game. He missed six weeks of the season with an undisclosed injury. Zach Metsa had a pair of assists two games played for the Central Illinois Flying Aces. In 51 games played between Central Illinois and Youngstown, Metsa has 20 points (2 goals, 18 assists). Since his trade to Central Illinois he has 7 points (1 goal, 6 assists) in 14 games played. Cameron Boudreau had one goal in Saturday's 6-1 Jr. Bruins win over the South Shore Kings. The late 1999 born defenseman finished the regular season with 12 points (3 goals, 9 assists) in 42 games played on the blue line. The left shot defenseman is steady in his own zone, plays with physicality, retrieves pucks well and is solid at moving the puck. He is currently number 117 on the NHL Central Scouting mid term rankings. Marcus Chorney of the Amarillo Bulls had one assist in three games played this past weekend. In 52 games played, Chorney has 23 points (5 goals, 18 assists) with a minus 7 rating. He also recently took part in the NAHL Top Prospects game for Team South where in 2 games he had one assist. As a 1997 born player he is part of the 2018-2019 recruiting class. Matt Cassidy had a goal in 3 playoff games so far for the Brooks Bandits as they swept their best-of-five first round series with the Canmore Eagles. They now await their second round opponent. John Campomenosi's Don Bosco Prep team fell in the New Jersey Non-Public State Championship 4-2 to the Delbarton School who won their third straight title. Campomenosi will now head to juniors before attending Quinnipiac. Jack Silich had one assist and dished out 7 hits as the Chicago Mission won the Illinois Bantam AAA Major State Championship. Silich was also invited to participate in the 2018 AHAI player development camp for midget and bantam players on March 23-25 of this year. The Mission will head to regionals this weekend followed by Nationals on April 5th. Jacob Quillan of the Steele Subaru Major Midgets had two goals in yesterday's 5-3 win over the Cape Breton West Islanders. In 9 playoffs games, Quillan has 8 points (3 goals, 5 assists). 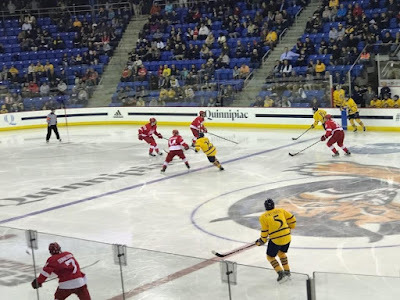 A night after getting their doors blown off in a 9-1 rout, Quinnipiac was much more competitive in this game and showed a lot more fight than they did in Game One but fell short of forcing a decisive Game Three on Sunday. Keith Petruzzelli (13 saves) once again started for Quinnipiac. Sophomore goaltender Andrew Shortridge was sidelined due to an injury which forced him to miss the last two series against Yale and Cornell. Quinnipiac had 60 shot attempts in the game but what has been the story of this season they really struggled to find the back of the net. Cornell had 23 shot blocks which thwarted a lot of Quinnipiac chances. The Bobcats in the first period really tightened up on defense and out shot the Big Red 8-1 which was a big contrast from the night before when they were thoroughly dominated throughout the majority of the first period. Just 2:01 into the second period Alex Rauter's (11th goal) hard work effort gave the Big Red the lead which they would relinquish. He took a rebound in the offensive fired a shot which was blocked and he took the loose puck and put the puck past a sliding Petruzzelli. In the third, Cornell's Anthony Angello got a five minute major and a game misconduct for a hit from behind on Scott Davidson. The Bobcats had a golden chance with a wide open net but the puck hit iron. A turnover in the Quinnipiac defensive zone gave Cornell the insurance goal by Mitch Vanderlaan (7th goal) at the 8:46 mark of the third period. Quinnipiac had another late five minute major that they could not convert on after a Mitch Vanderlaan contact to the head penalty gave him a game misconduct as well. Matthew Galajda (22 saves) recorded his 9th shutout of the season as Cornell moves on to Lake Placid for the second consecutive season while Quinnipiac's streak of five consecutive ECAC championship weekend appearances comes to an end. Seniors Kevin McKernan, Kevin Duane, Bo Pieper, Tanner MacMaster and Landon Smith (who was injured) helped lead the program to 94 wins and two trips to the NCAA tournament and a Frozen Four berth in their time in Hamden. Quinnipiac now has seven months to prepare for the next season as they try to get back to the NCAA tournament after now having missed it in consecutive seasons after a string of four straight appearances from 2013-2016. The Quinnipiac Bobcats men's ice hockey season is officially on the brink of extinction. The Bobcats suffered their second worst ECAC playoff loss since entering the league in the 2005-2006 season with a 9-1 loss at the hands of the top seed and #2 ranked Cornell Big Red at Lynah Rink on Friday night in Game One of the best-of-three ECAC Quarterfinal series. The only worse loss suffered by Quinnipiac was in the 2008 ECAC Quarterfinals when they lost 11-0 in Game One to Harvard before winning 7-4 the following night. This game was a bit of a reminiscent of Game Two of the 2013 ECAC Quarterfinals when Quinnipiac blew out Cornell 10-0 on its home ice. Cornell clearly returned the favor tonight and they didn't let up trying to score either until into the third period. I wouldn't have expected anything less after the beating that Mike Schafer and his program took five years ago at the hands of Quinnipiac. After the game it was reported that head coach Rand Pecknold nor any of the players were made available for comment to the media in Ithaca. Cornell got on the board not even two minutes into the game. After an interference penalty by sophomore Alex Whelan, Cornell's Alec McCrea blasted a one-timer from the point from a feed by Brendan Locke. Quinnipiac goaltender Keith Petruzzelli (18 saves) was screened on the shot and had zero chance to save it. Cornell continued to dominate the first 10 plus minutes of the game. Quinnipiac evened the score on the power play when a Karlis Cukste shot was tipped in past Cornell's Matthew Galajda (12 saves) by Tanner MacMaster (13th goal). Late in the period Cornell grabbed the momentum and the lead for good when the puck after coming off the end wall bounced off Keith Petruzzelli's stick and right to Alex Rauter who put it in on an empty net. A little more than a minute later Jeff Malott gave the Big Red a 3-1 lead and from there the flood gates opened. Petruzzelli gave up three more goals including a pair to Mitch Vanderlaan and one to Beau Starrett before being pulled in favor of fellow freshman Josh Mayanja (5 saves) who was making his collegiate debut. He proceeded to give up three more goals to Alex Rauter, Starrett and Cody Haiskanen before Rand Pecknold turned back to Petruzzelli for the third period. Quinnipiac will look to rebound on Saturday night at Lynah Rink in order to force a Game Three on Sunday afternoon. The Chaska, Minnesota native has exploded onto the scene in Hamden with a team leading 41 points (9 goals, 32 assists) in 36 games played. His 32 assists lead Quinnipiac and are most among freshman in NCAA Division I play. He has 15 multi point games which includes last week's Game 2 victory against Yale. He is the 11th Quinnipiac freshman to reach 30 or more points as a freshman and the first Quinnipiac freshman to reach the 40 point plateau since Sam Anas had 43 points back in the 2013-2014 season. A week after dispatching their Whitney Avenue rival in the Yale Bulldogs, Quinnipiac faces another familiar foe in the #2 ranked Cornell Big Red a team that Quinnipiac has faced more than any other team in the ECAC playoffs since moving to the conference back in the 2005-2006 season. This will be the teams 5th meeting in the quarterfinals with Quinnipiac winning three of the prior four meetings with the last three series going to a decisive Game 3. It's a bit of a role reversal as back in 2013 and 2016 Cornell was the #9 and #8 seeds in the ECAC tournament while Quinnipiac was the #1 seed both times and got pushed to the distance. Now with Cornell as the #1 seed and Quinnipiac the #9 seed will we see history repeat itself? Despite losing two games to Cornell this season, Quinnipiac played very well against the Big Red and could have won either games especially the one at Lynah. The Bobcats have played better at times on the road than they have at home this season so this might be a good thing for them to be away from home the rest of the way. While Cornell's record at 27-4-3 is very impressive along with their defense and goal-tending, I tend to think their record has been inflated a bit due to the down year of the ECAC and a soft as Charmin non-conference schedule. The best non-conference win is an average Boston University team that has underachieved massively. Their best conference win is probably against Union who is not even in the top 16 of the pairwise. While Quinnipiac isn't close to the top 16 of the pairwise they have three wins against the top 10 of the pairwise in Northeastern (2) and Clarkson. By far this will be the toughest defensive team that Quinnipiac sees the rest of the way. Talent wise they don't match up with all the draft picks that a Boston University has on the blue line but as a collective group there has been no one better than Cornell which has been a trademark of great Cornell teams of the past. Throw in Matthew Galajda who likely will win the league goaltender of the year and possibly the rookie of the year (though I think Tufto should win ROY) and they are very strong in their own zone. Cornell has rarely blown a team out in a game this year and when they do its usually a team that isn't very good so expect this series to be low scoring and probably pretty close. While this isn't the Quinnipiac teams of the past half decade it's still a team that shouldn't be overlooked and is capable of playing with anyone on any given night. If Quinnipiac plays to it's identity like it did last week it has a very good chance of winning this series. They are going to need to consistently hunt the puck which is a patented Rand Pecknold term. They need to bring a heavy fore-check in the neutral to force Cornell into bad decisions and turnovers which can create additional chances. Quinnipiac's depth is expected to be tested against a deeper Cornell team that is can be very physical at times. The Bobcats will need to be able to sustain that physicality along with keeping their emotions in check because these teams have a history of getting into scrums in the ECAC playoffs. They will again need more than just the Tufto line to step up in this series if they are going to win. Contributions from up and down the roster are going to be a key. Quinnipiac will also need to play strong defense with excellent gap control in this series. Goal-tending for the Bobcats will be a key and its likely we will see Keith Petruzzelli back in between the pipes again this series. He needs to play as well as he did against Yale because if he does that will be huge for Quinnipiac in which they can maybe use the defense (Priskie, Rafferty and even Fortunato) in a more aggressive role offensively. 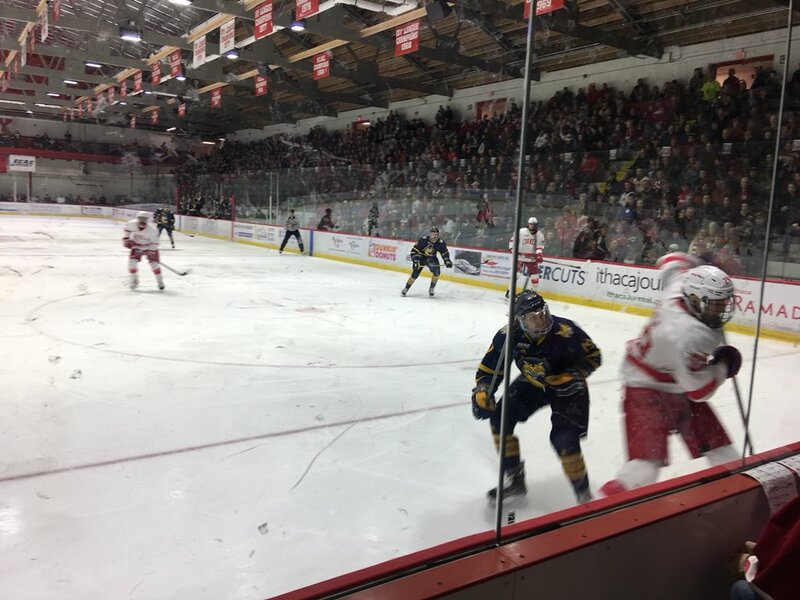 This is a very interesting match-up because you can make a case Quinnipiac could have swept the Big Red this season and definitely should have won the game at Lynah this year. No team other than Union and Yale played the Big Red tougher without a win or tie to show for it. 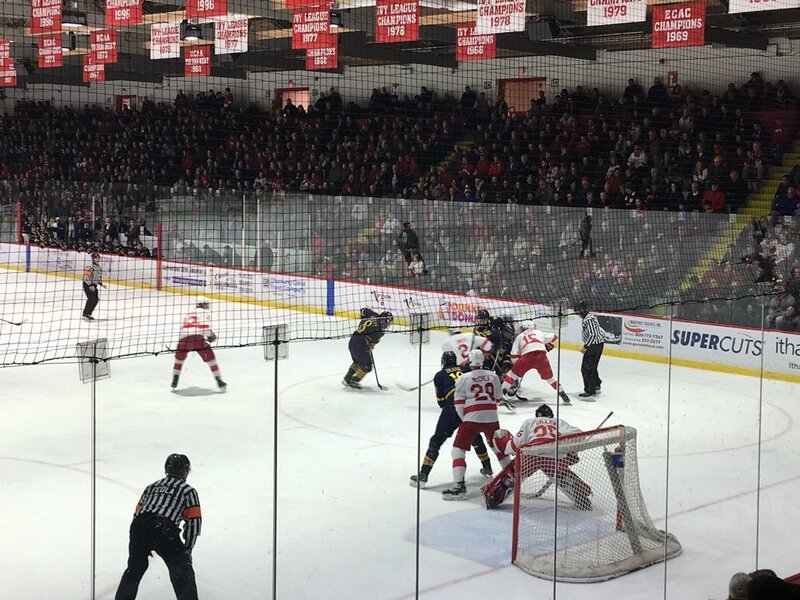 Quinnipiac has had a ton of past success at Lynah Rink especially in the past five plus years along with a lot of success against the Big Red in the ECAC Tournament. They also have a renewed confidence and have played well in the second half of the season and I think they will play really well against a good Cornell team on the road at hostile Lynah Rink which is a big home ice advantage for the Big Red. Its really hard to beat a team three to four times in a season especially if you have played them extremely close the prior two times. This was the best match up in my opinion for Quinnipiac more than any other higher seed remaining for them to play due to how well they play against them historically especially in the playoffs. Quinnipiac recently picked up a late 1999 born defense-man in New Hampshire native Cameron Boudreau who currently plays for the Junior Bruins in the USPHL NCDC division. Boudreau is expected to arrive in Hamden for the 2019-2020 season after one more year of junior hockey. The BobcatsHockeyBlog recently caught up with Cam to talk about his decision of choosing Quinnipiac along with hockey in general. Thanks to Cam for taking the time to do this. BobcatsHockeyBlog: First off congratulations. What are your emotions like after making this decision? Cam Boudreau: Thank you! And of course I was very excited to commit to Quinnipiac. It was also a huge relief to finally know where I'm going to be going to college. My parents and I couldn't be happier. 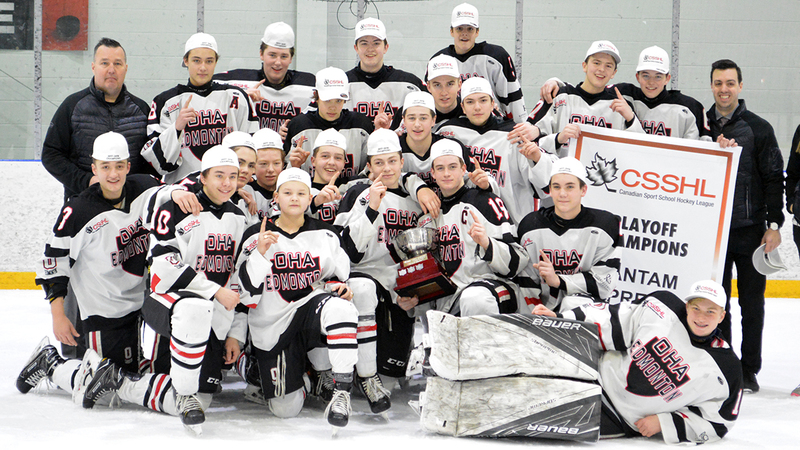 BobcatsHockeyBlog: Tell us about your overall recruiting process. When did Quinnipiac first start to show interest in you as a player? Cam Boudreau: I had been in touch with colleges for a while but no serious interest came until this year. Coach Riga had been at a bunch of my games throughout this year, initially to watch Guus van Nes who has since previously committed to Quinnipiac, but then after the All-star game was my first time personally talking with the Quinnipiac coaches. They told me they wanted to come down for a visit and they would continue to watch my progress. BobcatsHockeyBlog: You said you went down for a visit. What were your thoughts on the campus, the facilities, the setting and did you know at that point, that Quinnipiac was where you wanted to go if and when they gave you an offer? Cam Boudreau: I thought the campus was beautiful, and I absolutely loved the rink. I enjoyed the new feel that the facilities had. At that point I was keeping my options open but I remember really being able to see myself there. I didn't want to get my hopes too high because I didn't have an offer at that point. BobcatsHockeyBlog: What other schools showed interest in you? Cam Boudreau: There were many who showed interest, but when it came down to seriously considering me as a player for their program, it was Quinnipiac, Vermont and Merrimack. 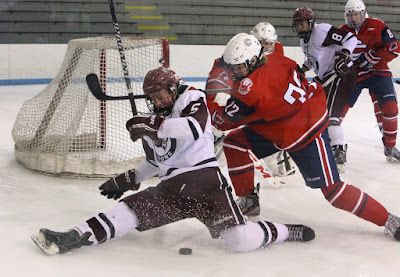 BobcatsHockeyBlog: You played the previous two seasons at The Governor's Academy and made the decision to go to the junior route with the Junior Bruins of the NCDC. What went into that process to leave the prep ranks before your senior year? Cam Boudreau: I really loved everything about Governor's. The school was great but we had just been struggling as a hockey team. I was given a great opportunity to play for the Bruins and it definitely has worked out great for me. BobcatsHockeyBlog: Tell us about your overall game. What are some of your strengths as a player? What are some of things you are looking to improve upon? Cam Boudreau: I feel that I can skate with and without the puck really well. I can defend well with my stick and believe I can break out the puck well. I'm looking to improve as an all around player and my ability to make plays at the blue line. BobcatsHockeyBlog: Do you consider yourself more of a stay at home defense-man or one that can play two ways? Cam Boudreau: Definitely two ways. I really enjoy shutting guys down but also love hopping in the rush as well. BobcatsHockeyBlog: Your currently ranked 117th for North American skaters on the NHL Central Scouting mid-term list. Have you had a lot of contact with NHL teams recently and what are your thoughts on the draft process as this is your first draft eligible year? Cam Boudreau: I haven't had too much contact with NHL teams at this point but being drafted would really be a dream come true for me. BobcatsHockeyBlog: What are your plans for next season? Do you plan to return to the Junior Bruins at this point or will you try to make Dubuque (USHL) after being drafted by them in 2017? Cam Boudreau: It really depends on what Quinnipiac wants me to do. I know they have a great relationship with the Junior Bruins, so as of now I think I'm going to stay where I am at. BobcatsHockeyBlog: Is there a player you try to model your game after? Cam Boudreau: No not really. I try to play to my strengths and stick with what I do well, rather than what other players can do. BobcatsHockeyBlog: Who to this point has helped you the most to get you to this point in hockey career? Cam Boudreau: I've always been lucky and had some of the best people to help me get better on and off the ice. Brian McGuirk, Cody Ferrio, Eddie Hill, and Jon Hutcheon are just a few of the guys that have helped me in the off-season with improving my game. My parents have supported me through every decision I've made from going to prep school and to juniors. They have always been there help in any way they can and still come to every single game that I have no matter how far. BobcatsHockeyBlog: Tell us the type of person that the Quinnipiac community is getting in Cam Boudreau? Cam Boudreau: I'm very excited to be an athlete at Quinnipiac as well as a student. I'm really looking forward to meeting some new people. BobcatsHockeyBlog: What are some of things that you enjoy to do off the ice? Cam Boudreau: I really enjoy going to the beach and the lake. Some of my favorite things to do in the summer are paddle boarding, frisbee, and riding bicycles. Quinnipiac is once again headed to the quarterfinals of the ECAC tournament. 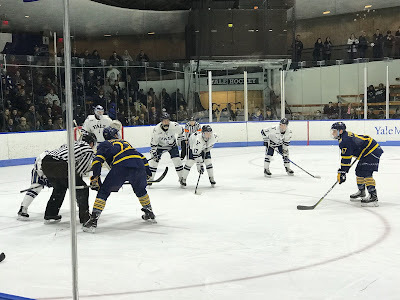 After going on the road 8 miles down Whitney Avenue to face Yale, Quinnipiac swept their rival out of the ECAC playoffs in convincing fashion winning 5-1 and 4-1. Next up for the Bobcats is top seed Cornell at Lynah Rink. Quinnipiac was swept by the Big Red this season losing 2-1 and 1-0 but this team has prior success in the postseason against Cornell and have played very well in the past five plus years at Lynah. Expect a hard fought series and this to possibly go the distance as three of the four playoff series prior between them have gone to a Game 3. Now lets take a look at how some of the future Bobcats did over the past week. William Fallstrom had two goals and two assists in two games played this week for the Fargo Force. He was named the #1 star in an 8-0 win over Central Illinois. In 45 games, the Sweden native has 32 points (10 goals, 22 assists). Justin Robbins made one start this past weekend and gave up 5 goals in a 6-4 loss to Omaha. He made 33 saves on 38 shot attempts. On the season, Robbins is 5-5-0-1 with a 3.67 goals against average and a .880 save percentage. Wyatt Bongiovanni had a goal and one assist in three games played for the Muskegon Lumberjacks this past week. The Michigan native has 27 points (13 goals, 14 assists) in 31 games played. He missed six weeks of the season with an undisclosed injury. Zach Metsa had one goal in two games played for the Central Illinois Flying Aces. In 49 games played between Central Illinois and Youngstown, Metsa has 18 points (2 goals, 16 assists). Dom Fensore had one assist in two games played in USHL action this weekend. In 24 USHL games, Fensore has 12 points (1 goal, 11 assists). The BCHL playoffs are underway and there are five future Quinnipiac commits playing in the postseason and there will be playoff action all weekend and not just the weekends. St. Louis, Missouri native T.J. Friedmann had 5 points (2 goals, 3 assists) in the first two playoff games for the Victoria Grizzlies. Despite his team in an 0-2 hole he has been one of the bright spots early in the playoffs. 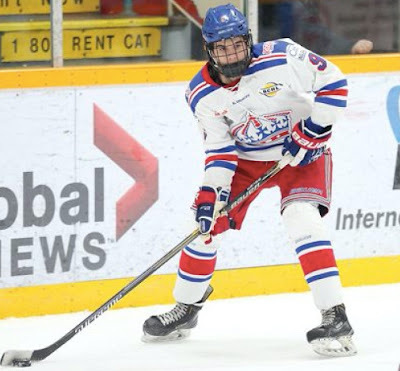 Ethan De Jong had one assist in the first two playoff games for the Prince George Spruce Kings in which they split for the Chilliwack Chiefs. Michael Lombardi had just one goal as the West Kelowna Warriors fell into an 0-2 hole against the Trail Smoke Eaters. While Lombardi isn't happy with these results, he is likely happy this past weekend as high prep high school Kimball Union Academy won back-to-back NESPAC Elite Eight Championships. 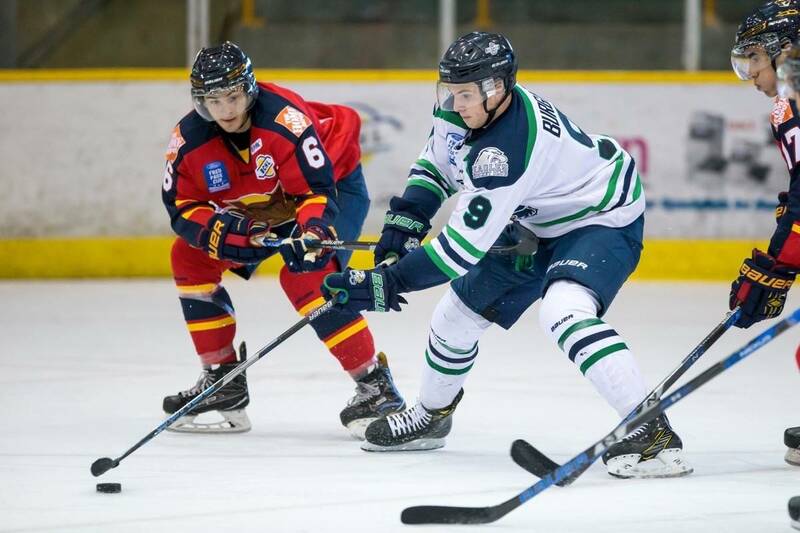 Desi Burgart had a goal and an assist as the Surrey Eagles took a 2-0 series lead over the Langley Rivermen. Connor Tait has six assists in three wins for the Jersey Hitmen NCDC team. He is currently on a four game point streak with 9 points (1 goal, 8 assists) during this hot streak. In 41 games played this season he has 21 points (7 goals, 14 assists) with almost half of his production coming in these last four games. Quinnipiac picked up a recent commitment of 1997 born defenseman Marcus Chorney of the Amarillo Bulls. He picked up one assist over the weekend in two games played. In 49 games played, Chorney has 22 points (5 goals, 17 assists) with a minus 7 rating. Matt Cassidy had a goal and one assist in three games played for the Brooks Bandits. He finished the season with 42 points (17 goals, 25 assists) in 52 games. Brooks now heads to the playoffs as the second seed in the South Division. Matthew Fawcett and Peter Diliberatore both fell short for NESPAC championships over the weekend as Fawcett's Winchendon School team fell in the small school semifinals 3-2 to the New Hampton School whiile Diliberatore's Salisbury team lost 3-2 to the Kimball Union Academy in the Elite Eight tournament. John Campomenosi of Don Bosco Prep had a goal and one assist in 7-0 win over Gloucester Catholic in the semifinals of the New Jersey non-public school state tournament. He has 28 points (8 goals, 20 assists) for a Don Bosco team that is will now play for a championship against #2 Delbarton on Monday night. 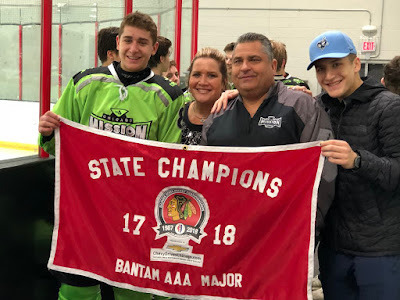 Jack Silich had two goals and one assist this weekend for the Chicago Mission in two games played in a state tournament. He will play in the championship game on Tuesday. On the season he has 90points (34 goals, 56 assists). Austin Spiridakis had one goal in three games in the AMHL best-of-5 division semifinals. His St. Albert Tire Warehouse Raiders team is trailing 2 games to 1 and needs to win a road game in Game 4 on Tuesday to force a deciding 5th game back on home on Friday. Jacob Quillan of the Steele Subaru Major Midgets had one assist in three playoff games this past week. In seven playoff games he has 6 points (1 goal, 5 assists). The No. 9-seeded Quinnipiac Bobcats scored the first three goals of the game en route to a 4-1 win and a sweep of the No. 8 seed Yale Bulldogs at Ingalls Rink on Saturday night in the best-of-three ECAC first round playoff series. Quinnipiac (16-16-4) outscored their Whitney Avenue rivals 9-2 over the two games. Since the 2013 season, Quinnipiac is now 5-0 in the ECAC playoffs against the Bulldogs. They will move on to the quarterfinals against an undetermined opponent. Quinnipiac played a complete sixty minute game tonight really taking it to Yale from the opening face-off and out-possessing Yale in the first period. "I was really happy with the effort tonight, Rand Pecknold said. Our battle level was great and our compete level was great. We really hunted the puck north, south, east, and west." 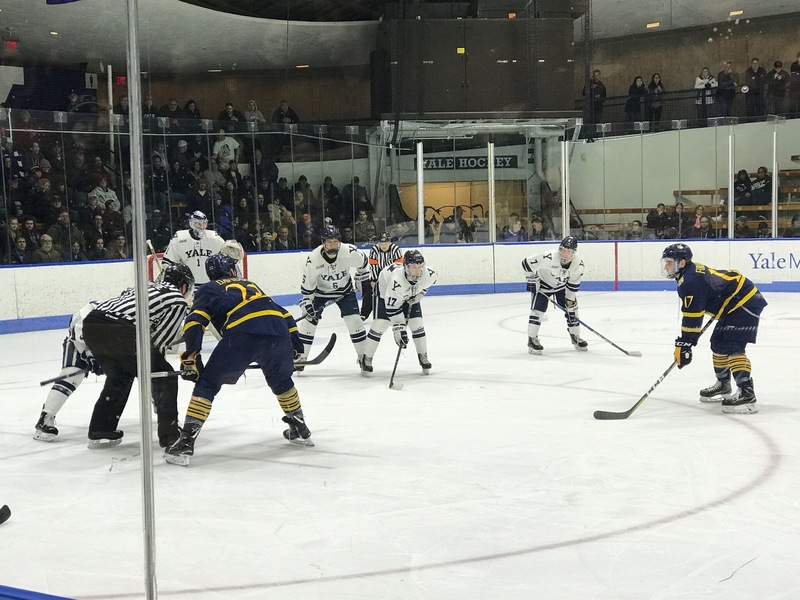 Yale goaltender Corbin Kaczperski's play kept the Bulldogs in the game in the first period as Quinnipiac could have had at least two goals in the opening period but the game remained scoreless at the end of the first period. Quinnipiac lit the lamp 4:41 into the second period with just a single second left on the power play when Odeen Tufto sent a no-look pass in front to a wide open Chase Priskie who buried it home past Kaczperski for his team leading 8th power play goal and 11th overall. With the assist Tufto is now tied with Brian Herbert (set in the 1999-2000 season) for the most assists by a Quinnipiac freshman with 32. He added a goal just under seven minutes later when Tanner MacMaster fed Tufto cross ice who buried a quick wrist shot past Kaczperski. With the goal, Tufto become the first Quinnipiac player to have 40 points in a season since Sam Anas in the 2013-2014 season. "We wanted to get a quick start, said Tufto. We wanted to jump on them right away. I think we did a good job of it. We got a lot of efforts up and down the lineup." Quinnipiac tacked on two more goals in the third, one on a nifty five-hole goal by Brogan Rafferty who worked around Billy Sweezey before sneaking a backhand shot through Kaczperski. “I made a risky move to the middle and it worked out,” Rafferty said. It was a good play by Kevin [Duane] in the neutral zone." 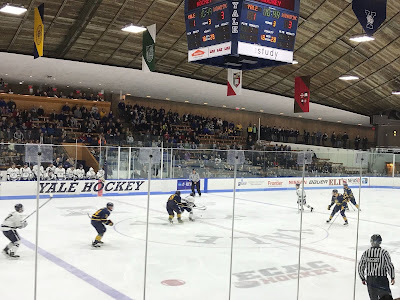 Yale cut the lead to 3-1 on an unassisted goal by Kevin O'Neill but Alex Whelan (16th goal) potted his second empty net goal in as many nights to close out the win. 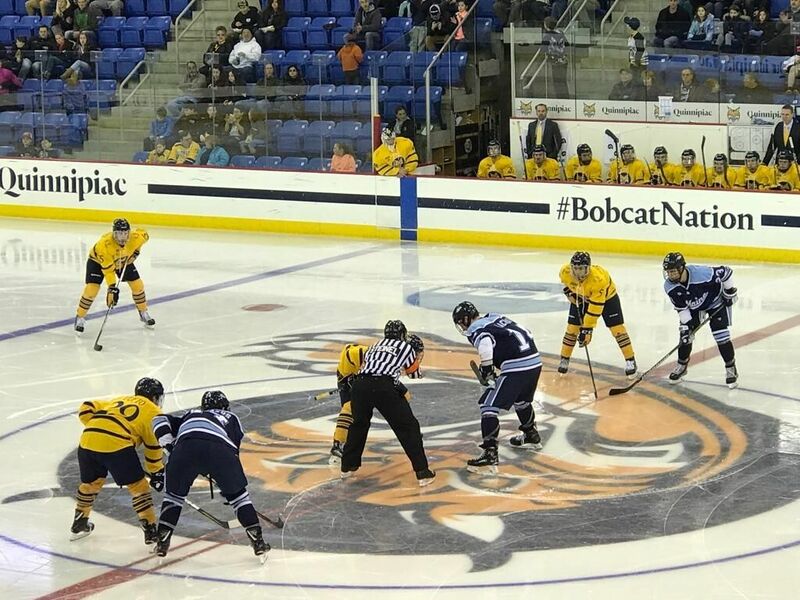 The Quinnipiac Bobcats gave up a first period goal but took control in a dominant third period en route to a 5-1 in Game 1 of the ECAC first round playoff series between the Whitney Avenue rivals on Friday night at Ingalls Rink in New Haven, CT. This was only the third playoff meeting between the rivals in the ECAC tournament with Quinnipiac winning the 2013 ECAC consolation game and following that up with a sweep of the Bulldogs in the 2014 ECAC quarterfinals. Quinnipiac also was playing a road opening round playing series for the first time in 12 years since the 2005-2006 season. It was the Quinnipiac secondary scoring that came through tonight for the Bobcats as Joe O'Connor, Kevin McKernan and Scott Davidson all scored goals tonight in the victory. 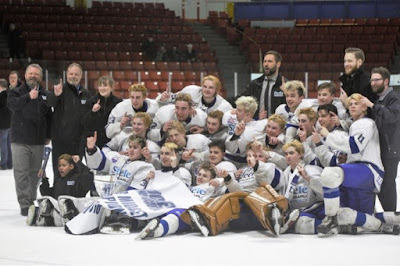 One of the big keys coming into this series was finding other players outside of Odeen Tufto and Tanner MacMaster score goals and through one game that looks to be the case. Quinnipiac was sluggish a bit in the first period with Yale having some sustained pressure and finding breaking through when Tyler Welsh split the defense and found Ryan Hitchcock who put it past freshman goaltender Keith Petruzzelli (21 saves) making his first career postseason start. Quinnipiac evened the score just 2:09 into the second period when Tanner MacMaster stole a pass just as it was heading out of the offensive and drove to the net before feeding to a charging Joe O'Connor who slid one past Sam Tucker as he was going to the ice. Just as they scored early in the second period, Quinnipiac took the lead early in the third when Scott Davidson fed Chase Priskie skating untouched through zone and sent a wrist shot five hole that trickled past Tucker which turned out to be the eventual game winning goal. "It left a sour taste in our mouth the last time we played here, said Priskie. We wanted to come back and get some redemption and we are glad we came out with the W."
The lead was extended again when Matt Forchuk's tremendous vision found Kevin McKernan on the back door for a goal. 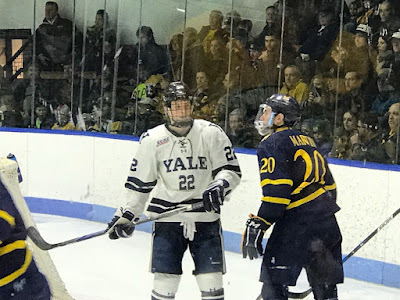 McKernan returned to the lineup for the first time since the 3-2 loss to Yale on February 9th and he did so by playing a wing position instead of defense. "The first period was pretty tough playing forward, said McKernan. The legs felt a little heavy but once you I got into it, it wasn't bad. I don't mind it running around the ice a little bit with Davo [Davidson] and Chucker [Forchuk] as it made it easy." Alex Whelan iced the game with his team leading 15th goal of the season by way of the empty and Scott Davidson added another one in the final minute five hole past Tucker. "I thought it was good win tonight, said Rand Pecknold. It was a good battle. We struggled a bit in the first and Yale was good. The message after the first was we need to play better and I thought we did that. we really battled. We played a good honest game tonight with good habits and kept it simple. The passion and care was there and if we are going to do that and play to our identity, we are going to win a lot of games." Quinnipiac will go for the sweep tomorrow night at Ingalls Rink in New Haven as they look to close out the series and advance to the ECAC Quarterfinals. The Quinnipiac Bobcats and the Yale Bulldogs. The Battle of Whitney Part III. It's always fun when these two teams meet and its even better when it comes in the ECAC playoffs. The one negative is that this series will be played in Ingalls Rink instead of Quinnipiac's home fans at Perrotti Arena. Still this game should have a lot of Quinnipiac fan support with the short drive to New Haven. 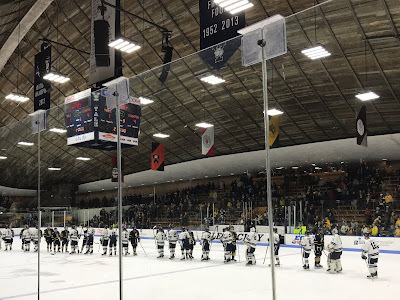 These two teams split the season series with Quinnipiac winning 3-0 in Hamden and Yale beating Quinnipiac 3-2 in New Haven for their first win in the series since the 2013 NCAA Championship game in Pittsburgh. Its the first regular season win since a 6-1 on February 18, 2011 and the Bulldogs last home win over Quinnipiac since October 6, 2010 when they beat Quinnipiac 5-1. For more in depth on this series check out the Q&A with @Yale_HockeyBlog. Quinnipiac has had a ton of past success against Yale in the last seven plus years outside of the loss in the 2013 national championship and a loss at Ingalls this season. The Bobcats have had numerous depth issues especially at forward where they lack high end talent and it has shown on the ice for much of this season when they struggle to score goals. At times they have had to use natural defenseman at forward positions just to help with these issues. It will be interesting to see how the depth issues play out in this series. Both Quinnpiac and Yale feature a star player. 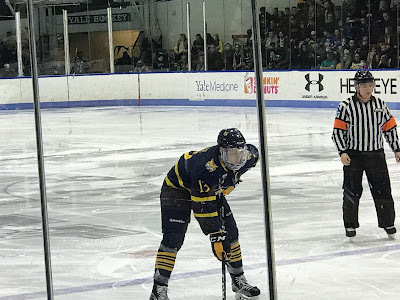 For Quinnipiac its freshman Odeen Tufto who is likely the ECAC rookie of the year and may challenge for the National rookie of the year while Yale has Joe Snively'a 36 points including 19 goals helping to pace the Yale offense. Quinnipiac kept Snively pretty quiet in two games with him recording only a single assist in the 3-2 win against the Bobcats in early February. Tufto has 14 multi point games which ties him for the most for an NCAA freshman inn the last six years with Jack Eichel (Boston University). Tufto has a goal and an assist in two games against Yale this season and has points in 9 of his last 10 games and 11 of 13. His 39 points are the most for a Quinnipiac freshman since 43 by Sam Anas back in the 2013-2014 season. Secondary scoring for both teams will be a key as well as who will be in net for each team. Quinnipiac really needs to find scoring from more than just Tufto, MacMaster and a few others so they can rely less on the defense being forced to help offensively and focus more on defending their own end with strong puck movement and gap control. For Yale getting strong defense and timely scoring will go a long way for them if they want to win this series against Quinnipiac. All in all this should be a great weekend of hockey in New Haven. 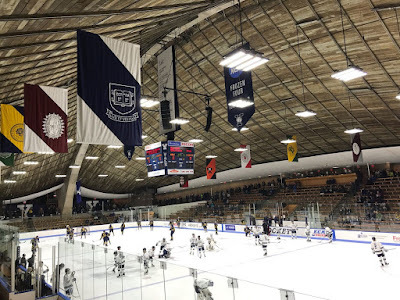 Both teams are 6-4 in their last 10 games and Yale picked up a win over Quinnipiac during that stretch along with a season ending win over Harvard which secured the site of this match-up. This is a pretty even match-up in terms of talent maybe Quinnipiac has just a tad more but its not much. The most underrated aspect in this series will be the last change that Yale has in which they can match-up with the Tufto line. While I think the talent level is pretty close between these two teams and the fact that Yale has the ever important final change I think this series should go the distance. Somehow I think Quinnipiac finds a way offensively to get some timely goals. I feel the crowd could help Quinnipiac out as well and the past success to me is a factor and that they just match up really well against the Bulldogs. It won't be easy but nothing in the ECAC ever is.